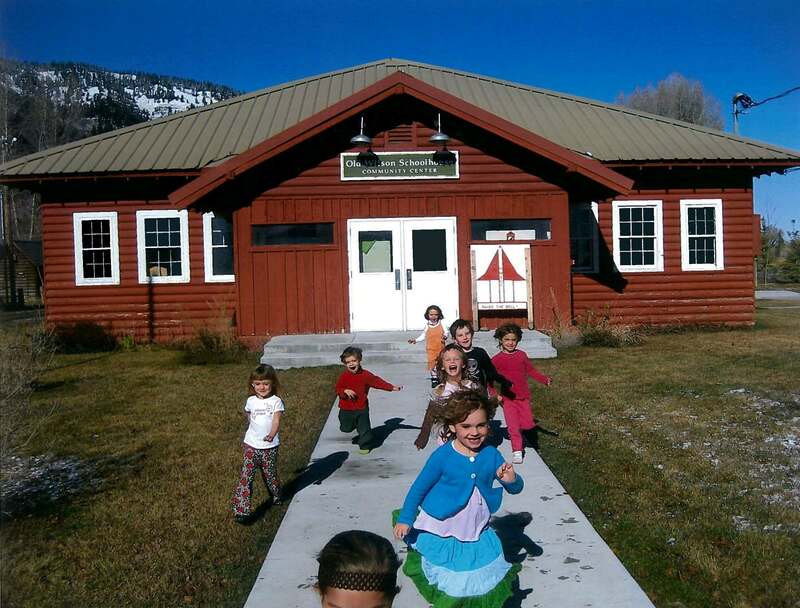 Young visitors to the historic Old Wilson School House Community Center, which dates from 1930. Teton County, Wyoming, (population 20,002) serves as the southern gateway to two national parks: Yellowstone and Grand Teton. Originally populated by several Native American tribes, the valley was visited during the return journey of the Lewis & Clark expedition and became a prime location for fur trappers and mountain men in the early 1800s. French Canadian trappers named the three prominent peaks of the area “Les Trois Tetons,” or the three breasts: Grand Teton, Middle Teton, and South Teton. As part of the Hayden Expedition of 1871, William Henry Jackson took the first photographs of the area. His photographs, along with sketches by Thomas Moran, were important in helping convince Congress to protect Yellowstone, leading to the creation of this first national park in 1872. Grand Teton National Park was created in 1929 and greatly expanded in 1950 through the efforts of John D. Rockefeller. The economy of Teton County is primarily supported by tourism. The parks draw millions of visitors to Teton County each year, contributing to an effective daily population of more than 36,000. Over 97 percent of the 2,697,000 acres of land in Teton County are federally or state owned or managed. The Wyoming Centennial Scenic Byway, which passes through the county, will soon have interpretive signs and audio programming, thanks to the efforts of the town of Jackson, the state, Grand Teton National Park, the U.S. Fish and Wildlife Service, and the Jackson Hole Chamber of Commerce. The town of Jackson was named in 1894 and now serves as the county seat. Other small towns in the county that mark original settlements include Moose, Moran, Kelly, and Wilson, and each maintains its own historic assets, helping preserve a strong sense of community. Wilson, on the west side of Teton County, is home to the Old Schoolhouse, vacated by the county school district in 1999. Rather than see the historic log building demolished, a group of concerned citizens formed a non-profit and worked with the county to save the schoolhouse. With a $1/year lease from the county, the non-profit organization managed the school as a community center, a home for several small businesses, and a link to the valley’s past. When structural and safety issues surfaced, the facility was closed for restoration, funded by the Wyoming Business Council. These partnerships gave this historic asset a sustainable new function, hosting more than 13,000 local and tourist visits annually. Teton County is a Certified Local Government. The town of Jackson and the county have a joint comprehensive plan, which includes a commitment to support reuse of existing structures as an alternative to redevelopment. The county has conducted three surveys of potentially historic properties, identifying 40 as historic.